Solar is in many ways the most promising of the low carbon technologies. It is highly scalable, with an essentially unlimited resource (see below). Costs have decreased rapidly in recent years, and there is no obviously binding limit on how much costs can come down. Deployment has risen rapidly. This page looks at how deployment might continue in future, and what might limit that growth. To estimate how fast solar PV deployment will grow, I’ve adopted a simple logistic function (s-curve) model for the deployment of solar. This type of function is widely used to model the growth of new technologies[i]. The results for two scenarios are shown in the chart below together with actual annual deployment to date. Both scenarios fit the historical data well, and are similar for the next few years, but then diverge significantly. Source for historical data: BP statistical review of world Energy to 2017, estimate for 2018 based on data in previous post. The low case is based on an electricity system continuing to grow at current rates, with solar taking an increasing share, and deployment eventually reaching 300GW p.a. (see notes below for more on this). The base case assumes a larger role for the power sector in the energy mix, as decarbonisation drives the electrification of end use, and solar deployment eventually reaches 50% more than in the low case, at 450 GW p.a.. These projections show deployment in another 4 to 6 years reaching more than double its 2018 rate of just over 100GW. This compares with the 3 years it took to double from 50GW to its present size. By 2030 solar is generating 3600 to 4500TWh p.a., around 12-15% of electricity consumption[ii]. Of course this highly stylised analysis only gives an indication of scale, and even greater growth is possible. However I have not included a higher scenario, as these scenarios already represent continued very rapid growth. This will require continuing attention to how solar can best be integrated into wider energy systems, including through the greater use of battery storage. This section looks at what might limit solar PV’s deployment if costs continue to fall and reach levels low enough to allow for additional expenditure on grids, storage and demand-side infrastructure while remaining economically competitive. I’m not taking a view on if or when this will happen, or how low costs might become – there is still a significant way to go to reach that point. I’m simply looking at what the remaining barriers would be if they did. I’ll use some rough and ready numbers to look at what it might take for solar to produce around a third of the world’s electricity consumption. I’ll assume this illustratively to be about 17,000TWh (out of a total of around 50,000TWh) by mid-century, which would be around 180 times the 2012 total of around 93TWh of solar PV output. A solar industry meeting a third of world electricity demand would be very large, but not infeasibly so. It would require about 300GW of capacity to be added each year on average worldwide, around three times the current installation rate, which has grown to its current level in just a few years. Matching the timing of peaks by moving power from where the sun is shining to where the demand is located could imply tens or hundreds of GW of power to be moved across continental distances. This is because the point at which the sun is highest in the sky (around noon), when solar output tends to be at its maximum, moves quite quickly across the surface of the earth. At the equator it travels at just over 1000miles/hour, implying that to service demand even an hour later in the day power must be moved hundreds of miles from west to east. 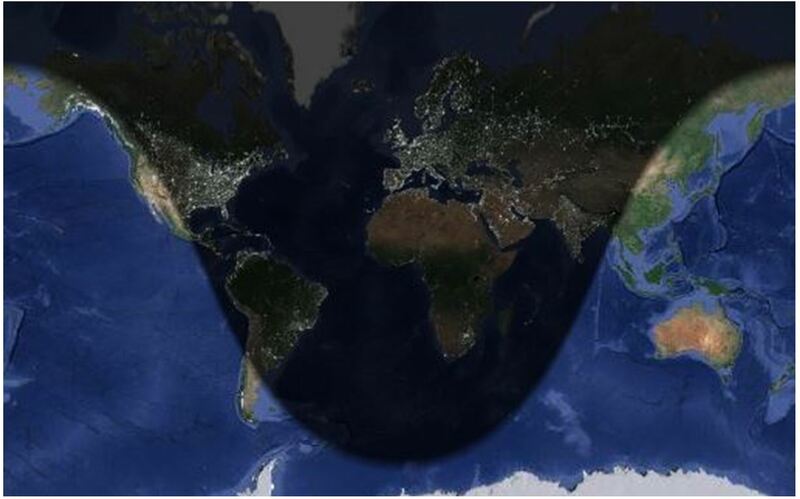 The chart below shows how far west you need to go to shift the time of peak one hour later at the latitudes of some of the world’s major cities. 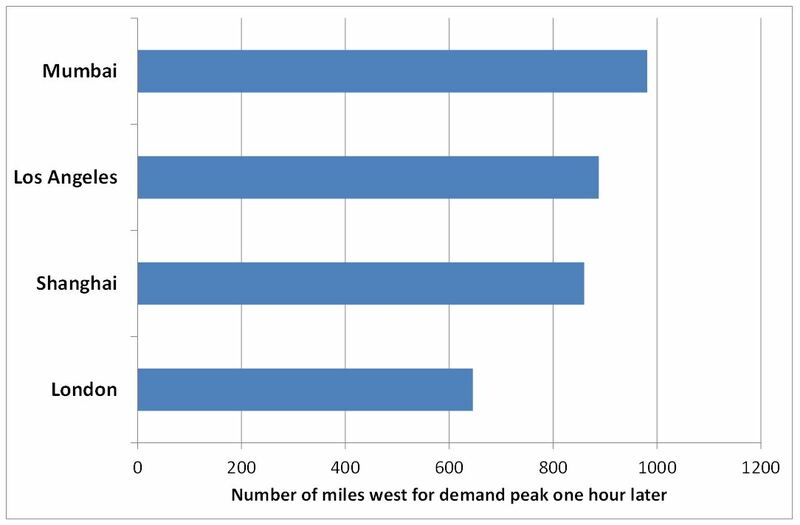 To move the peak a quarter of the day – from a noon production peak to 6pm demand – you need to move power a quarter of the way round the world. And the direction does not always help. To meet later demand on the US west coast solar panels would need to be out in the Pacific Ocean rather than Arizona and Texas. (Though west-facing panels can help here). China, with its population concentrated on the east coast, is better served in the evening, but would run into problems in the morning. This implies that load balancing using transmission will be a huge challenge from a technological, regulatory and commercial perspective. Building storage to address this problem is challenging because of the huge scale needed. The subject is too large to go into here in detail, but in northern Europe very large amounts of storage are required even to balance load within the day. Seasonal storage (because for example average intensity of sunlight in the UK is nine times higher in summer than in winter) would require enormous capacity. Germany’s subsidy for storage as part of new residential PV systems and California’s plan for 1300MW of storage by 2020 were early examples of the type of initiative that is likely to be required. Among other effects the premium for hydro power for load balancing is likely to increase. And reductions in load factor due to no storage being available and so surplus remaining unused at peak will be less of a problem the lower the capital costs of solar become. Building transmission and storage infrastructure, along with the arrangements to manage them, will take decades at the scale required. And getting the costs of storage down will remain hugely challenging, despite the enormous progress made in recent years. This will be accompanied by the need to make significant changes to market mechanisms so that they can more effectively balance supply and demand. None of this will be achieved easily, and strong policy drivers are likely to be required for this to happen as fast as now looks likely to be required if solar is to play a central role in decarbonising power systems. A low case is estimated by looking at the size of the power sector. This requires (in very approximate numbers) about 1000TWh of new and replacement generation each year over the next couple of decades. If a third of this were to be solar it would eventually grow to about 330TWh p.a. of this, or about 300GW p.a.. It seems unlikely that solar’s share of new capacity would in the long run be less than this given its cost competitiveness and scalability. This scenario appears roughly in line with Shell’s Sky scenario. Both suggest that by 2035 Solar PV generation will be a factor of a little over 20 higher than in 2015. However, this eventual rate of deployment may be an underestimate. Decarbonising the energy system will require widespread electrification of end use, and so much more of the world’s energy will come from low carbon electricity. For this analysis I’ve chosen a figure for eventual installation rate 50% greater than in the low case, reaching of 450GW p.a.. 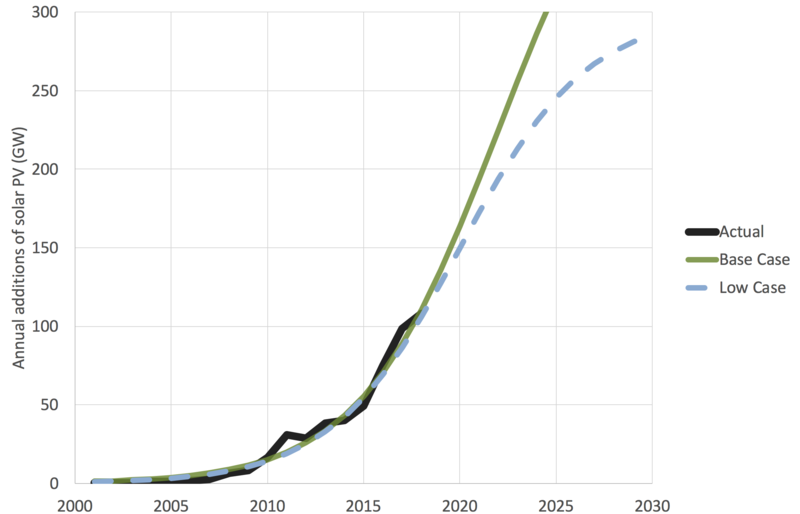 This represents one possibility within the range of scenarios for more ambitious decarbonisation, and higher estimates are possible. [i] A logistic function is often used to model deployment of new technologies based on a range of examples, and I’ve previously used this type of model to look at electric vehicle growth – see here including examples of previous technology transitions. The analysis presented here updates my previous analysis of solar in both data and approach, given the additional data available since that was completed. [ii] World electricity consumption was 21,000TWh in 2015, https://www.statista.com/statistics/280704/world-power-consumption/ growing at 2.6% p.a. over 2010 to 2015. Assuming this growth rate is maintained electricity consumption will reach around 31,000TWh by 2030. BP’s review of energy suggests a lower growth rate, with around 2000TWh less demand in 2030 than in the case used here, presumably reflecting greater efficiency.